Provide your Godmother with a beautiful Personalized Keepsake Box to store her most precious little keepsakes she has saved while enjoying time with her god child. Our Godmother Personalized Memory Box is handmade of natural cherry wood with inside felt lined compartments and hidden solid brass hinges. This keepsake box measures 7½ x 4¾" x 1½". 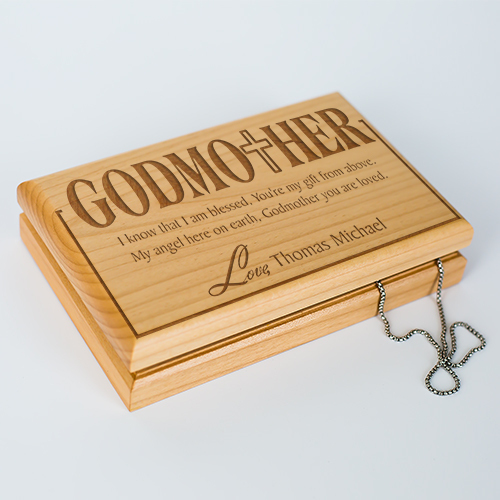 Godmother keepsake box includes free personalization! Personalize your Godmother wooden keepsake box with any Godchild's name. I know that I am blessed, You're my gift from above. My angel here on earth, Godmother you are loved. Giftsforyounow.com has a large assortment of Personalized Frames & Personalized Godparent Gifts. We have a personalized frame for all of your special Occasions. Personalized Birthday frames, personalized love frames, personalized wedding frames, personalized baby frames, personalized Christmas frames, personalized frames for your sister, personalized frames for your grandparents & personalized gifts for mom & dad.